Here's a question that comes up often enough on the forums and in email inquiries that I think it deserves a quick how-to article. Suppose you've created a session in Pro Tools, and started recording right at "0" (or 1| 1| 000) on the timeline, but later you decide the song would sound great with a new introduction added to it. But since you started at 0 on the timeline, there isn't any physical "space" to insert the new intro into. How do you "add space" to the beginning of the session? There's frequently more than one way to accomplish a task with a DAW program, and this one is no exception. If you're in a hurry, you can go to the Setup menu, select Session, and change the session's start time in the Session Start box. But if you're relatively new to Pro Tools, an alternative approach may be a better idea, because it's going to give you an opportunity to become familiar with some tools you'll be using on a regular basis. This article will walk you through those steps and introduce you to a few of those tools and time-saving keyboard shortcuts. Pull up the Edit screen. That's the one with the waveform displays. If you're on the Mix (mixer) window, you can toggle over to the Edit window by pressing Control / +. In other words, press and hold the Control key down on your keyboard, then while holding that, press the "+ ("=") key, located right below your F (function) keys. For you Mac users, the keyboard shortcut is Command / + (Command key, plus the + key). Each time you do, the display will toggle between the two main screens in Pro Tools. It will NOT work if you try to use the "+" key on your calculator keypad on the right side of your keyboard. Once you have the Edit screen displayed, you need to get your Groups displayed. They may be visible already, but just in case they aren't, have a look at the screenshot in Figure 1. The oval in the lower left hand corner is where you need to click to display (or hide) the Track list and the Groups. Try clicking on that spot a few times and you'll see what I mean. Once you have clicked there, you should be able to see the Track list as well as the Groups. I've used an arrow to show the location of the Groups. "All" is a default Group category, and all you need to do to select it is to click on it. Once you do, it will be highlighted, any edits or changes will affect ALL tracks, not just individual ones. Figure 2: Selecting the "All" group will enable you to edit all tracks simultaneously. A quick keyboard shortcut for enabling or disabling the Groups (so that you can edit a single track within the group without affecting others, or so you can go back to editing all items in the group together) is Control / Shift / G. Hold down the Control key, and the Shift key and the G key all together. Mac users, use Command / Shift / G. If you add a new key to the combination one at a time - hold the control key down, add shift and hold both, then add the G key) it works fine, or you can depress all three simultaneously - just as long as all three get held down together for a moment, it will work. Each time you repeat that keyboard shortcut, it will toggle between groups active, and groups disabled (greyed out). To create a new group, use Control / G. If you're a Mac user, hitting Command / G will do the same thing for you. Groups are a fantastic way of editing multiple tracks, such as a multitrack drum kit recording or multiple tracks of background vocals simultaneously. Get into the habit of using them, and you'll save a ton of time when working in Pro Tools. Figure 3: The arrow on the left indicates the program is in Grid Mode, while the one on the right shows the location of the Grid Value ("grid size") box. See the red arrow on the right side of the image in Figure 3? That's the box for selecting the Grid size. In the picture, it is set for a quarter note. By clicking anywhere to the right of the word "Grid" within that indicated box, you will see a drop-down menu that will allow you to change the subdivisions of the Grid. Unfortunately, my screen image capture software doesn't want to catch the drop-down menu, but give it a try and you'll see what I mean. Figure 4: The Nudge value box (indicated with the red arrow) is set for a one-bar nudge. The maximum Nudge amount is one bar, which is what I've selected. Again, double-check to insure that you have "All" selected in Groups (lower left hand corner), and that you have Grid Mode selected (F4 / upper left hand corner of the screen). Now use your mouse and click directly on the waveform display - anywhere to the RIGHT of the longest track. While holding the left mouse button down, drag the mouse to the left, over to "0" on the timeline. If done correctly, you should see that you've highlighted the entire range of all of the tracks. Now we're ready to move them. There are two ways you can do this. You can simply hit the "+" key on your keyboard's numeric keypad (do NOT try to use the "+" key below the F / Function keys on your keyboard -- it won't work). Since we have changed the Nudge amount to one-bar, every time you press on that "+" key, the tracks will be nudged or moved one bar later in time, and because we've selected "All" in Groups, all of the tracks are nudged or moved simultaneously. Want to move them back the other direction? Just use the "-" key on your numeric keypad. Here's a screenshot of the same set of tracks after I've nudged them 12 bars later in time (Figure 5). The red ovals indicate the new start time of the nudged tracks (they now start at bar 12) and the Nudge amount (1 bar). The red arrow shows the direction they were nudged, and the 12 bars of new "space" at the beginning of the session that you can use to record your new intro. If you need more than 12 bars, you can obviously add more. Figure 5: The same set of tracks after being nudged 12 bars later in time in order to create space for additional intro material. Remember when I said there was a couple of ways you could move the tracks over? Instead of using Nudge, you can just put the session into Grid mode, select "All" in Groups, and then select all the files by dragging over them from right to left as we did with the previous example. Then press F8 to select the "Grabber" tool (the one shaped like a hand), and then click on the waveform display and merely drag everything over. When you do, they'll "snap" to the grid, at whatever resolution you have the Grid set for. To get back to your normal "I Beam" selection tool, just press F7. Oh, one more thing: Those Function keys on your keyboard are a real time-saver. Instead of using the mouse to switch between different editing tools, you can use the Function keys. Also, if you click on any of these more than once, you will cycle through the various alternative states / modes of operation for that particular tool. And by clicking on any two of the following - F6, F7 or F8 - for example, depress F7 and F8 simultaneously, you select the "magic" tool. It gives you the functions of all three of those tools (Trimmer / Selector / Grabber), depending on what part of the region (top half, bottom half, end of a region, or region crossfade points) you have the cursor sitting over. That's my favorite tool mode in Pro Tools - I can do a ton without having to change anything... but even if I do need to change tools, since I have all those Function keys memorized, it's automatic for my left hand to just reach up and hit whatever mode I need in order to do something different, such as switch to the pencil tool to fix a click or glitch in a wave file. And that's the key to speed with any program -- getting to the point where you hit the keyboard shortcuts without having to think about them. It takes time, but hopefully this article will show you the benefits and get you started. I’m going to do something I don’t think I’ve ever done before. I am going to highly recommend a program that runs only on Windows. In fact, I am going to recommend a program that’s so good, I bought an HP laptop running Windows 7 JUST so I could run Sony VEGAS’ Professional NLE. Nobody is more shocked than me. As a die-hard Mac guy, this is a big step for me. But enough about that. Let’s talk about the one professional video editor I’ve tried that’s affordable, easy-to-use, and a good fit for photographers who want to jump into editing their hybrid video footage. Let me say this is a mini-review. I won’t cover all the features of this program. I’ll write about it from a photographer’s point of view. My main concern as a photographer is how I get footage from the various fusion cameras I own, i.e., Canon 1D MK IV, Nikon D7000 and assorted compact and mirror-less cameras, into a non-linear editor, add sound, special effects, color correction, etc., and then get it out into a usable format. Sony Vegas Pro 10 is how. I own Final Cut, iMovie, and Adobe Premiere. With the exception of iMovie, they are all over my head. But using Vegas, within an hour, I was able to import multiple kinds of video and still footage onto one timeline, edit the in and out points, color correct, add transitions like cross fades, add simple titles, do some audio sweetening and prepare for output to everything from Apple .MOV files to Windows WMV files to Blu-Ray at the hit of a button thanks to an amazing export template offered in Vegas Pro 10. Sony Vegas Pro 10 combines video effects, media generators and animation tools to help you produce incredible final footage. One thing I really like about this program is that it doesn’t matter what kind of footage you place on the timeline, Vegas can handle it. It mixes and matches H.264, Mov, AVCHD, XDCAM EX, RED and many more onto the same timeline then figures out how to make it work on export. The program supports SD, HD, 2K, and 4K workflows. Of particular interest to my audience will be the fact that it handles footage from the Canon HDSLR hybrid cameras extremely well. The Sony engineers have worked with the CODEC to make sure that the video is very quickly and efficiently decoded. If you’ve worked at the professional level with this footage, you know that it almost always has to be transcoded to get real-time playback during editing. Not so when you’re using Vegas. This was a smart move by Sony. They could have simply provided the advantage to footage coming from Sony branded cameras. They were astute enough to recognize that the Canon cameras own this market and they did something about it. I applaud them for it. Our test machine, an HP Intel i-5 processor with six gigs of RAM was able to play smooth footage out of Vegas every time. This included Canon footage. Pretty amazing for a $900 computer and a sub-$600 NLE. While I’ve just covered a few features, Vegas can do lots more, including editing 3D even. The interface is easy, you can add infinite tracks, there is 64-bit support, Closed Captioning Support, video plug-in architecture, image stabilization (that really works), 5.1 Surround encoder etc. Like Photoshop, Vegas has features you may never use, but it’s nice to know they are there. There are a few things I am not sure I like about Vegas 10. You can’t scrub the timeline. (UPDATE I didn’t realize you can scrub the timeline. Turns out you can. Hover over the cursor in an area of the timeline that does not contain an event and press Ctrl.) The second thing I am unsure about may be a blessing to some people and a curse to others. Sony Vegas 10 doesn’t rely much on the Graphics Processing Unit (GPU). If you have a fast computer without a fancy graphics card you’ll be happy you’re not being penalized by the program for that oversight. But if you are a person like me who has invested in faster graphics for your computer, you won’t see much of the benefit when running Vegas. These are minor quibbles. Considering the fact that I can actually make this thing work, I’m much more focused on what it does do well, than what it’s missing. I can tell you right now if you’re one of those photographers who bought a Canon 5D MK II or similar fusion camera and you have tons of footage sitting there mocking you from your hard drive, there’s no longer any excuse not to do something about it. If you can get your hands on a Windows machine, Vegas is the answer in my opinion. The program has lots of power and while it can do most of what Final Cut can do, it’s much easier to learn. I can also say that there’s significant training support available for Vegas. I investigated this carefully because I know most of my audience will be concerned about how they learn to use this software. Vegas comes with lots of cool help files and at sonycreativesoftware.com you can find more free training options as well as free forums. Sony will even support you while you learn the program for free for 30 days. This 30-day period should be enough for most people, but you can purchase additional tech support to talk you through learning stuff at reasonable prices. For instance – six months of this support will only set you back $150. And e-mail tech support is always free. In addition to free webinars, a newsletter, and other free downloadable resources, Vegas is tied to other training options. Below is a quick list of resources I’ve already compiled. CreativeCow also has a community of Vegas users. As I said in the beginning, this is a program that is so good, it’s worth buying a Windows machine to use it. At just more than $500 on Amazon, Vegas Pro 10 is a steal. Previous Sony Vegas users can purchase an upgrade at a reduced price. While the serious professionals who edit movies over at Industrial Light and Magic may scoff at the idea that you can use anything other than Final Cut Pro or Avid to edit a movie, I disagree. Especially for those of us who are photographers first, and video editors second, Vegas Pro 10 is a superb, well thought-out, well-supported product that will get the job done. Highly recommended. There used to be a common joke among musicians aimed at bass guitar players, which ran "What's the similarity between playing a really good bass line and wetting yourself? You get a nice warm feeling, but no-one really notices!". These days, however, bass plays a prominent role in many musical genres. Dub reggae wouldn't get far without bass, and nor would many rhythm-heavy styles such as those found in Latin and South American music. But even outside these styles, bass can be crucial to the sound and 'feel' of a track. A well-played and well-recorded bass is vital to any rhythm section, and it's worth making the effort to achieve the right sound. A good bass guitar sound starts with a reasonable-quality instrument played well. Given that starting point, you then have to decide whether to mike up a bass guitar amp or to adopt one of the possible DI methods -- or you could combine both, as do many professional engineers. The simplest recording method is to DI the bass, but unless the instrument has active pickups (if it needs a battery, it probably has), you can't just plug it into a mixer input and expect good results as there will be an impedance mismatch. The right way to do it is to use a DI box with an input impedance of at least 500k(omega) and preferably higher than 1M(omega). Virtually all active DI boxes that feature an instrument input fulfil this requirement, and a number of passive transformer-based models are also suitable. "...if you can save the EQ until you mix, you'll keep your options open." of high end without significantly affecting the main body of the sound. This usually makes the bass sound tighter and cleaner. Another useful technique involves combining the equaliser with a speaker simulator such as my personal favourite, the all-passive Palmer Junction Box. Speaker simulators are designed to duplicate the high-frequency rolloff of real speakers, so you can still use your outboard EQ to shape the low and mid sounds, then allow the speaker simulator to take care of the top end. A well-designed speaker simulator will take away all the grittiness from the sound without killing the transient attack, and will often sound more natural than using EQ on its own. Most engineers use a degree of compression with bass guitar, which is a good idea for a number of reasons. If the player uses a slapping or pulling technique, the note attacks can be very loud, so if you don't compress or limit, you either run the risk of overloading the recorder or you have to set the record level so low that the main body of the bass sound is too quiet. This type of playing is best dealt with using a compressor that has a separate limiter, as the traditional way of making a compressed sound retain its attack characteristics is to set the compressor attack time to several tens of milliseconds in order to allow the initial transient to get through uncompressed. The release time is generally set to around a quarter of a second, but this will vary from model to model, so always experiment. Auto-attack and release settings (where available) also produce good results on bass guitar as they can adapt to the changing dynamics of different playing styles within the same song. Allowing the transients to sneak past the compressor might produce a great sound, but it's those same transients that cause recorder overload problems, so having an independent limiter section following the compressor is very desirable. The limiter threshold should be set just below the overload level of the recorder so that limiting takes place only on very loud peaks. Some of the best bass guitar sounds come from valve amplifiers, and as all guitarists and bass players know, valve amps distort rather musically when you drive them hard. A number of modern studio processors either include valve stages or offer 'tube emulation' with varying degrees of success. You can even get valve DI boxes, such as the Ridge Farm Gas Cooker, and using any one of these can help beef up a bass sound without making it sound obviously distorted. Of course, if you want the Stranglers' bass sound, a suitably-set overdrive pedal might well do the trick. Where you place the valve device or valve emulator in the signal chain is really down to where it sounds best, but if you want to be purist about it, it should come before the speaker simulator if you use one. That's because in a real amp, any distortion created within the amplifier circuitry is filtered by the limited high end response of the speakers, and if there's a lot of distortion, it is important to remove the high end to prevent grittiness. If you like an easy life, some preamps designed specifically for recording guitar also work well with bass. Last month I reviewed (and subsequently bought) the Line 6 Pod physical modelling digital guitar preamp, and initially wondered why they didn't make a bass version. However, after a little experimentation, I found that by using a Fender Bassman amp model combined with a 4 x 12 speaker cab and no effects other than compression and a little amp drive, I could get a very convincing miked bass amp sound. One practical advantage of a digital product of this kind is that you can be quite certain of the maximum output level as you can never get louder than 'all bits on'. If you deliberately overload the input by plugging in a hot synth so the clip LED comes on, whatever comes out is your maximum level! You can safely set your record levels with reference to this level. Then all you need do is plug in your guitar, make sure the input clip LED isn't coming on, and you can play in the knowledge that your recorder will never clip, no matter how you adjust the preamp drive or tone controls. "A well-designed speaker simulator will take away all the grittiness from the sound without killing the transient attack, and will often sound more natural than using EQ on its own." speaker grille, you could find the bottom end tends to lose power. A better bet is to use either a non-vocal dynamic mic that has a reasonably flat low-end response or to try one of the dedicated bass/kick drum mics, placing it around six to 12 inches in front of the best-sounding speaker in the cab. If you look at the frequency plot of a kick drum mic, you'll find the frequency response looks like the back leg of a donkey that's just been hit by a truck, but the results are often flattering and powerful, which is far more important than any misplaced notions about accuracy! If you're using a valve amp, you may find you don't need to add further compression, or at least not much, but if the amp is solid-state and doesn't have a compressor of its own, then it's probably a good idea to at least try adding compression to see what can be achieved. The safest approach here is to leave the compression until you mix unless the levels are so erratic that clipping might be a problem. Tonal changes can be made by moving the microphone -- the brightest sound is found by pointing the mic at the centre of the speaker, while moving it to one side will produce a warmer, less in-your-face result. It's also worth varying the distance to see what result that has. Try adjusting the mic position for the best results before adding any EQ at all, and if you can save the EQ until you mix, you'll keep your options open. After all, what may sound great in isolation may not sound so right when the rest of the mix is up and running. If you really want to go to town on the bass sound, try combining a miked amp with one of the DI techniques described earlier. Often you can get away with a smaller amp than if you rely on the amp sound alone, as the DI will provide all the bottom end you need. This combined approach is taken by many professionals. The relative phase of the miked and DI'd sound has a profound effect on the final result, so you may need to phase-reverse one of the sources to get the best result. Also, experiment with the EQ of the individual sources as well as their balance, as the EQ controls may not have the same effect as they do when the sources are heard in isolation. Similarly, changing the mic-to-speaker distance will also affect the phase of the combined sounds, so this can be useful in fine-tuning the result. What do you do after you have spent hours in Adobe Premiere Pro CS5 and Adobe After Effects CS5 creating your Oscar winning video? Well, you can output for the web to share with the world. But, what happens if you want to share it with family and friends? Maybe it is a non-stop thrill ride that was your Hawaiian Vacation, or it was the melodrama of little Johnny’s first birthday or the thriller that was your daughter’s wedding and you want to share that in an as goof-proof way as possible? What if you are a professional and you do videos for a living and your clients want a DVD or Blu-Ray disc. For all of these situations and more you turn to Adobe Encore CS5. Adobe Encore CS5 is Adobe’s professional grade disc mastering application. It allows you to take video and put it on DVD or Blu-Ray complete with custom animated menus, fancy motion buttons and more. Adobe Encore CS5 offers all of the features you want all wrapped up in a clean and simple to use interface… the Adobe interface. In a single operation, you can easily turn your DVD and Blu-ray disc projects into web DVDs that now include a search interface. The new interface gives viewers a more engaging experience by enabling them to search within a web DVD using keywords. During authoring, Encore automatically creates a search database using metadata from speech-analysis text, subtitles in timelines and slideshows, and menu and button names. Further enhance the viewing experience by creating web DVDs with a sleek, customizable playback interface that features easy-to-use playback controls and the option to watch HD video in full-screen mode. Create a smoother experience for viewers when they choose from options across multiple menus on Blu-ray Discs. Browsable multipage menus show options across multiple menu pages without interrupting the playback of audio and video background elements. Multipage menus can be easily created in Adobe Photoshop or directly in Encore. Working in the Adobe Premiere Pro timeline, you can take 4K projects directly to high-definition Blu-ray Discs using a workflow that maintains the original 4K content all the way to output, when it is finally encoded and scaled. This capability is especially meaningful to video editors and motion graphics and visual effects artists who work on projects at film resolutions. Continue authoring while you transcode your media assets. Adobe Media Encoder, a separate, 64-bit software application, encodes your files in the background, freeing Encore to process your authoring tasks. This separation of authoring and encoding is particularly important with 4K workflows, which can be taxing on your computer. System Requirements: Intel Core2 Duo or AMD Phenom II processor; 64-bit support required ■ 64-bit operating system required: Microsoft Windows Vista Home Premium, Business, Ultimate, or Enterprise with Service Pack 1 or Windows 7 ■ 2GB of RAM (4GB or more recommended) ■ 10GB of available hard-disk space for installation; additional free space required during installation (cannot install on removable flash-based storage devices) ■ 7200 RPM hard drive for editing compressed video formats; RAID 0 for uncompressed ■ 1280×900 display with OpenGL 2.0-compatible graphics card ■ Adobe-certified GPU card for GPU-accelerated performance; visit http://www.adobe.com/go/premiere_systemreqs for the latest list of supported cards ■ Adobe-certified card for capture and export to tape for SD/HD workflows ■ OHCI-compatible IEEE 1394 port for DV and HDV capture, export to tape, and transmit to DV device ■ Sound card compatible with ASIO protocol or Microsoft Windows Driver Model ■ DVD-ROM drive compatible with dual-layer DVDs (DVD+-R burner for burning DVDs; Blu-ray burner for creating Blu-ray Disc media) ■ QuickTime 7.6.2 software required for QuickTime features ■ Broadband Internet connection required for online services. Included With: Adobe Creative Suite 5 Production Premium ■ Adobe Creative Suite 5 Master Collection ■ Included with Premiere Pro CS5 Standalone. One of the key elements in rock mix is thick and heavy guitar sound. One of the effective ways to accomplish this sound in the mixing process is through a technique called as "Double Tracking". In this post I will illustrate how to double track guitars in the mix with the objective of making it heavy and thick. a. Compression on guitars to make it sound thick. b. Applying effects such as maximizer to increase loudness. a. The recording of the guitar should be free of noise and normalize to the maximum volume. b. If the guitar is recorded twice, it should also be clean and normalized. But it is not required to record it twice. c. Record with the best distortion tone you need. Do not record it yet if you are not yet convinced of the distortion tone. Much better to experiment with a live band before starting to record the guitar. The overall purpose is to have a clean and final recording ready for mixing. Remember it is not advisable to fix the distortion tone in the mix; it makes the mixing process to be complicated. d. Double check the tuning of the guitars, even slightly out of tune guitars can be problematic since if you double tracked it will tend to worsen the out of tune guitars. It is also highly important particularly in the recent pop rock music trend to achieve not only thick guitar sound but it is also a wide guitar sound. This will achieve the “airy” sound of the distorted guitars. So how do we start the mix? 1. Start with placing the 1st track in the Track one of the mixing session. 2. Place the other guitar track in the Track two of the mixing session. If you are recording only once, just copy and paste the wav file in the Track one to Track two. 3. Pan the Track one to -75 units (left). Depending on your recording software, this could be in %, for example if the maximum left pan setting is 100% so it will be 75/100 or 75%. 4. Pan the Track two to 75 units (right). 6. To even make it heavier, do not anymore apply reverb on any of the tracks ( it is highly important that the reverb is from the room and amp based reverb that will be realized during the recording process). It is because if you start applying reverb on the guitar, it will tend to sound weak and far. Since you are mixing for rock, it is important to get the “in your face” guitar sound. 7. EQ it properly, do not cut too much bass in the distorted guitar, it will help add the heaviness sound. 8. 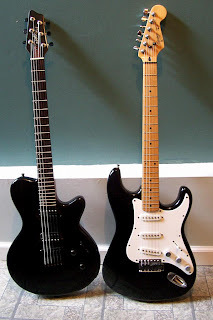 Cut 1000Hz and 800 Hz on any guitar to make sound so clean and avoid the cracking sound. 9. Adjust the track one and track two volume and stop when it is loud enough for the guitar tracks to be heard, not dominating the vocals. 10. Cut 3000Hz with around -6dB and Q of 1.0 for both guitar tracks. c. Reverb (optional) necessary only if the guitar tracks is too dry.